I think you pulled back a little too much here Steve. They were in the middle of a massive transformation, within themselves and operating in and across the markets in global settings and heavy asset investment industries. You cant compete again asset light alternatives (technology driven) but they took the terrific decision to take it on as part of their transformation, the industrial internet. Regretfully the operating culture just did not respond with the same sense of urgency, it simply absorbed change and it never made the difference required. Lean appealed to the culture of performance GE had but it was not enough without linking it into other parts of a more robust program of change. They had no Change Vice Chair, it was missing. Will they come out of this present crisis yes but in a shape not recognizable to what Immelt had seen. Not good days ahead for GE I feel with R&D stripped down and the engineering and scientific talent all drifting away due to the repressive culture bearing back down on them. Yes GE had a very talented top-tier management group, forward-looking to provide the direction, like Beth Comstock but they did not drive the changes deeply enough, they instead kept layering on additional ones and ‘talk these up’ inside and externally. Thank you for this great post that highlights a topic often discussed in corporate corridors and rarely brought to shareholders. Should innovators and business transformers create “activist innovators” to balance back the effect of activist innovators? * to balance back effet of activist investors? The problem of innovation goes back to Welch, who in practice increased the value of GE cartolarizing it. stopping investments in new technological trajectories. Himmelt doubled it, sistematically firing middle management ( the doers who know what to do ) and kept “baloonist” high performers ( the sayers who don’t know what to do, but speak like Ulysses mermaids. The wWhale was already dead when sharks bite. Innovation is made by persons. Thanks Steve. Another important and insightful post. I have one concern about the message of “speed and urgency” to fend off raiders. 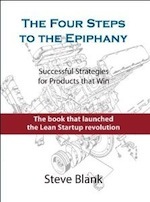 The concept of “lean”, the parent of lean startup, has always been about both “do the thing right” and “do the right thing”. 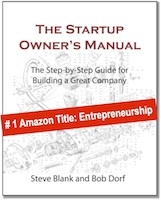 I fear too many companies are frantically doing lean startup on any opportunity they can get their hands on. This could qualify as innovation theater in my view. I wonder if a little more focus on thoroughness (vs speed) on the “do the right thing” part of it wouldn’t be a better approach for most companies. Sounds all too familiar. I hope the lean thinking doesn’t get bundled in with the things that went wrong. Never underestimate the high white blood cell count of a large patient bureaucracy. Steve Blank’s piece is well-balanced and fair, both to GE and to activists investors. My thoughts are the opportunities for market value based on book value where if you consider from a book value basis (past, current, future)… then you are in fact going by the books and not getting into anything (even if socially accepted for time period) criminal intent and acts. Granted, like a business plan and hunting for investors… there are the marketing, advertising and sale methods that drive even the stakeholders in the business and not only the shareholders. Now, per the definition and meaning of the origin of the term “business” I think active business stakeholders and even those future interests need jobs so having the civilians being civil and busy is critical for public health and safety… not only general welfare and well being. Having lazy passive revenue stream “activist investors” making people unemployed, lazy, spoiled rotten and really not validly re-investing capital for survival requirements implements with some luxury for the modern period of civilization isn’t questionable or arguable other than those desperate to steal and free ride a passive income without constraints in earning and taxes or required re-investment or maintenance of investment periods. With modern investments methods… studying economic cycles of different periods where the most modern are split second at times is something different and questionable also. Granted, there will always be longer term investments to hold for longer periods… can be different and challenging without an awareness of social mood with the market. Challenges that I don’t want to get into now, though looks like there is change and as someone noted above… with change you need change controls with technical and management review and approval and change management and a champion to lead the way. I follow your posts and enjoy reading them. However, your email newsletter is very hard to read and I believe needs improvements in look and feel. We are able to help. I would love to give you a lifetime free account to use our platform for that purpose. Let me know if you are available to talk. It’s an honor to work with you. Interesting perspective. Thanks! It sounds like the business model is becoming more important than the purpose. The beginning of the end is near. Hi Steve; thanks for writing this; as a long time admirer of GE and Jack Welch especially; it was sad to read. Jack Welch was once asked if he could do it all over again; he would choose biotechnology. Anyways, we hope GE doesn’t get all its profitable business units sold off and very sorry for what happened to Jeffrey Immelt; however looking back at Immelt’s reign this may be another example of your piece on the differences between the executive CEO vs. the visionary CEO; and hence the result if the ‘executive’ isn’t able to become a ‘visionary’? Also; perhapsGE can appoint new leadership that will galvanize the work force of GE from within like Microsoft and regain stockholder confidence and support after appointing Satya Nadella then this may help GE; as the current leadership maybe overpowered by the activist investors as was done to Yahoo recently; hopefully GE can turn things around. Another great company at the mercy of short term gain with significant long term pain. I was exposed to a water heater coy here in Australia which had a brilliant innovation and R&D division. The powers that be killed it all off – sold to the highest bidder and they maintained market share for about 5 years. But then, things started to go very wrong – there was no innovation coming through. The pipeline of new projects was empty and low and behold, they were in more trouble than the early settlers. The company is now owned by an offshore entity and they have become predominantly an importer of product from Asia. The investors made a squillion and exited stage left. The macro impact is never measured but it is significant. I fear GE is heading the same way. Makes me think about the challenge of short term gains that are more bipolar versus long term steady average growth with returns and stability. Seems even the economic metrics are even changing in the U.S. from gross household factors (I feel the Christian faith or Asian respect to not dishonor family faiths provided long term stability) to more corporate economic without consideration for domestic or local resources and more emphasis on importing the resources or outsourcing the processing using foreign resources with nothing other than sales left with marketing and advertising teams to promote the potentially fraudulent accounting by the finance department which to me acts as an accounting department sales team. Then government of the corporations that want the rights of people that profiteers off armed robbing the people for tax dollars when criminal black market business operations are performed… if you even can say they’re a business and not continuing criminal enterprise. Then you get the valid for survival implements being drowned by the corporate mobs of liberal activists that bum rush the valid intent and spirit business to butcher or pulverize them into the mob that buries and write everyone off the books they can. Literally, targeting the stakeholder and retirees even to steal their pensions both corporate and government entitlements. All, so the attorneys rackets and organize crime gangs can create arguments and not required for survival sugar coated larceny, robbery and even armed robbery hostile takeover desensitized to the public methods and situations. I see economic warfare in some cases if not many. Where the most advanced domesticated complex humans are being targeted for genocide by mobs of sub humans. Edit: Then government of the corporations that wants the rights of people; that profiteers off armed robbing the people for tax dollars when they themselves are, or support a, criminal black market business operations… if you even can say they’re a business and not just whats left running trying to look official really a continuing criminal enterprise. Excellent. Will quote next to last paragraph. Short-term predator necessitates long-term prayer. Thx Steve. Learnt so much in 3 minutes. Innovation for the sake of innovation have gotten us to where we are now. Where we are now is simply a bunch of inventions that have beautiful design that we purchase and they have no actual use. Vaporware and vapor design are byproducts of an economy that has no consciousness. Do you member the tin man in the Wizard of Oz. The tin man needed a heart that was industry. The strawman need a brain because he was agricultural and needed to get an education. The lion, on the other hand wanted courage. Each was given a certificate so what happens is today the same certificates are given out yet students end up with hundreds of millions of dollars worth of debt and they have no heart,no brain, no courage. Where is the glory in this ?? Mr Blank – I can’t begin to tell you how much I enjoy your writing and approach. I own a small business in TX and in the last year we’ve implemented a half dozen ideas that came directly from your insights. We aren’t a giant company or the defense department, but so many of your ideas have been instrumental in our dramatic growth. Thank you for your invaluable contributions – our 27 employees thank you! There are times when you have to establish and grow a business. Then there are times when you have to transform or reinvent a business. And sometimes you have to milk and fillet a business. You are very fair to activist investors. I would call them “vampire investors.” They are parasites that drain the company of intellectual value, which lessens the company’s contributions to the overall economy and capability set. It’s funny how the word “activist” is almost always a glaring red flag. And as always with “activists”, these “activist investors” claim to be doing good, when in reality they’re doing just the opposite. Interestingly, this means that the groups within these organizations need to eat their own dogfood. They are themselves a startup with a value hypothesis, “We as the inhouse innovation team help people in our organisation who want to innovate by doing … and … unlike the status quo”. They then ought to do the things that take them and their organization from initial hypothesis to a sustainable innovation pipeline. Hence the flurry of interest in crowdsourcing, hackathoning etc can be taken in one portion as learning about what is possible, but could(?) also in large portion as fixating on a set of services to be provided without developing and verifying a customer. I read the article. what would be the best solution to get GE back on track and watch it grow? 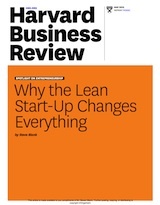 So does lean still apply or scale in big traditional corporates or not? Is Eric’s work inside GE all for naught? Same thing goes for P&G, which I thought had a very enviable innovation program that tied directly to new product development. But they also fired their CEO and looking at some rather draconian measures to boost profits. How to better tie innovation efforts to results that matter to Wall Street? GE under immelt took a 11 billion + pension fund an robbed it till he left it – 33 billion short what he did was criminal and he should be held accountable, and me as a long term ge employee will pay for his poor management for the rest of my life.GE has turned out to be a paper lion.